Unlikely neighbours at Pwllheli! Collett 2251 class 0-6-0 No. 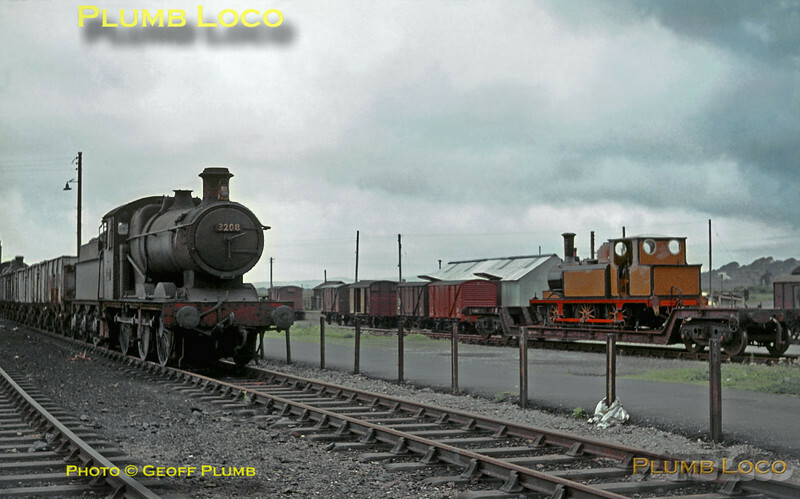 3208 was a regular at Pwllheli shed at the time, but ex-LB&SCR "Terrier" 0-6-0T No. 32640 certainly wasn't! Cosmetically restored to a semblance of its original livery, the 0-6-0T had been purchased by Sir Billy Butlin to install at the Holiday Camp at Pen-y-Chain along with ex-LMS "Princess Royal" 4-6-2 No. 6203 "Princess Margaret Rose". The "Terrier" had recently arrived on a well wagon and is here berthed in the yard awaiting removal to its new home. Saturday 8th August 1964. Slide No. 946.